- Supports the standard mail protocols IMAP,POP3 and SMTP. - Reading and writing of HTML mail. - Ability to display plain text only from an HTML mail. My experience using Kmail for more than 2 years, i think it is a good mail client, which makes me still use it until now. I use a commercial hosting and i make it for my email hosting too and the space is limited, just 375 mb, so i have to save my space for mail and i decide to use a mail client. I found K-mail and i tried it, i feel satisfy with it. Unfortunately, Kmail is only available in Linux, not in Windows, so for you want to try it, you have to use Linux first. I use 4 features mentioned above well. 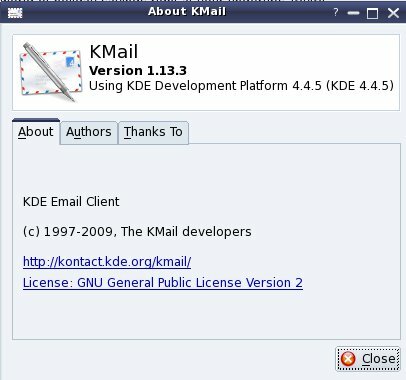 Currently i use K-mail version 1.13.3, using KDE Development Platform 4.4.5 (KDE 4.4.5) and it is installed integrated with KDE, so we don't need to install it separately. I don't use the latest Linux Mandriva version, Mandriva 2011, i still use Mandriva 2010.2, so i hope i can find the newest version of KMail too in the newest Mandriva version and i am sure it is better than what i have used now. 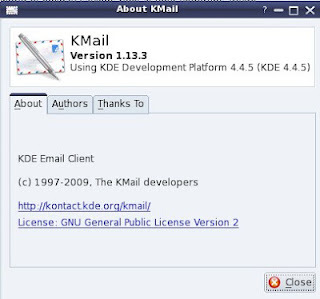 Last but not least, Kmail and also Kontact is a GNU license application, which you can get free. One of Integrated Development Environment (IDE) i have been using is Geany, it's my second IDE for my programming, especially in PHP. My main IDE for PHP is Netbeans for PHP which i have ever been told some times ago in this blog. This article will talk about Geany and my experience use it.But because Netbeans is my main IDE and Geany is my secondary one that doesn't mean that Netbeans is more suitable for everyone than Geany. The condition and your own taste decide it. Geany is same level with Notepad++, both of them are a small and lightweight IDE and good in PHP programming. 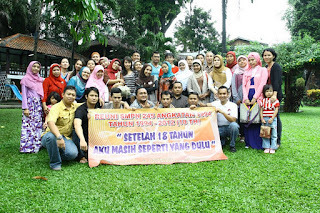 Geany also suitable for other programming languages or script such as C/C++,Java,Html,CSS,Phyton and Perl. And it is under GNU license so we can use it freely. Free and great that's 2 words for Geany besides small and lightweight.The last version today is 0.21 but although still under version 1.0 the ability as small IDE is good. If you do a middle and big project, particularly in PHP moreover do in a team, Netbeans for PHP is more suitable than Geany, because it support with features which easier your task in project management, debugging and subversion. But if you open a or some files not in a project , Geany is better than Netbeans. Geany is also good in doing a little project. In doing coding, Geany is good and nice to use, already supported with some features, i already mention above. Because i do a middle and big project as well as often open a or some files out of project, so i use both of them Netbeans and Geany and i feel comfortable with them. Geany besides available in Linux, it is also provides Windows Binary, so for you as Windows user you can use it too. 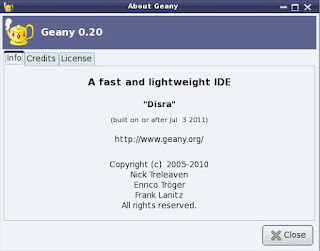 I myself use Geany for Linux version. So if you are looking for great, small and lightweight IDE, what are you waiting for, go to its website, download the application, install it and start to use it. 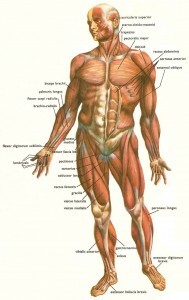 If you want more information about Geany, you can visit the site too.